Tired of waiting for those coveted gig phone calls? Be your own agent and book those gigs yourself! This object requires The Sims 3 Late Night Expansion Pack. This object was created with patch level 1.34, and has not been tested with any other patch level. This object is intended for Late Night Bands. It will have no effect on Showtime Gigs! This mod has no known conflicts. You may use this mod alongside core mods, tuning mods, and other script mods. This mod will not conflict with Nraas MasterController, Nraas DebugEnabler, or Awesomemod, which all have the ability to force a certain opportunity to pop up. Found in Buy Mode: Entertainment > Hobbies & Skills / Misc Entertainment. Decor > Misc Decor. Can be placed on community lots. Can be moved up and down on walls (shift-able). Cloned from the Forest-Fresh Corkboard. These are band-related opportunities which are not considered Gig Opportunities. If your sims are not in a band, they will not be able to use these interactions. 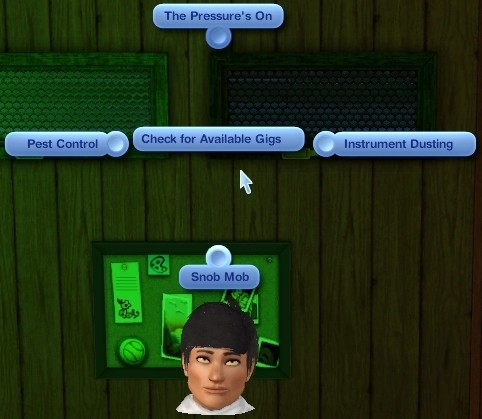 If your sim is in a band, but cannot accept an opportunity because the Skill Opportunity Slot is not open, you will see a tool tip telling you so. Your sim will only be able to see opportunities that are available. It may take 2-3 sim hours for a band opportunity to become available after creating a band for the first time. You must have Late Night venues (Bars & Lounges) in your town for a Gig to be available. If your sims are unable to fulfill a gig for some reason, you will receive a notice telling you so. It will not tell you why you are unable to fulfill the opportunity. This is an EA notice. Animation when using the object may be slightly off. cmo, for always pointing me in the right direction, and peter because he answers my questions!